hanks to Guardians of the Galaxy, 1970s pop stalwarts Blue Swede, the Raspberries, Redbone and the Runaways are finding themselves at the top of the charts again. The movie soundtrack Guardians of the Galaxy: Awesome Mix Vol. 1 is No. 1 on both the iTunes and Amazon digital-album lists (and No. 2 in Amazon’s overall CD sales) with a crop full of AM standards. Yet the tunes also factor into the narrative of the blockbuster Marvel Studios space opera. Before she died, the mother of Peter Quill (Chris Pratt) gave him a gift: a Sony Walkman and a mix tape of her favorite songs. So Quill’s outer-space adventures have extra resonance with David Bowie’s Moonage Daydream and Rupert Holmes’Escape (The Pina Colada Song) playing in the background. Found a great article by Jason Hughes of the Wrap.com. “Guardians of the Galaxy” is the most untested and most uncertain property yet to come out of the Marvel Cinematic Universe. Perhaps that’s why the studio has been blasting a veritable onslaught of promotional material in anticipation of the film’s Aug. 1 theatrical release. With all of those trailers, teasers, promotional images and behind-the-scenes videos, most everyone is probably aware of the movie, but do they really know anything about it? A talking raccoon and a tree that only says, “I am Groot.” It’s pretty weird stuff, but it’s developed a huge following in the comics community. What many fans may not know, though, is that most of the characters in the film have been around for decades in the pages of Marvel Comics, even though they didn’t come together as the “Guardians of the Galaxy” until 2008. Prior to that “GotG” was the name of a group of crimefighters in the 31st Century of an alternate Marvel Universe. This version is way more fun. Following is a quick primer for new and old fans alike, giving some background on the various characters that make up the larger Marvel Universe as shown in the “Guardians of the Galaxy” film. While there are no intended spoilers for the film, there are plenty of spoilers for comic book storylines. Proceed with caution. Peter Quill is the product of a human-alien liaison, growing up on Earth. The only relic he has of his alien father is his gun. After his mother is killed by an alien race, the Badoon, Peter was on his own. He takes on the Herald of the world-eater Galactus and winds up in an intergalactic prison. He is freed by Nova and takes part in a war against the evil villain Annihilus. He decides to form a new version of the “Guardians of the Galaxy” to take a pro-active stance against emerging galactic threats. The last of her people, Gamora’s entire species was exterminated by the Badoon. The intergalactic being Thanos found her and raised her to be a weapon. She became proficient in martial arts, but was unable to stop a vicious attack by a group of teenage thugs on an alien planet. After this sexual assault, Thanos cybernetically enhanced her. She eventually turned on Thanos, helping Drax the Destroyer and others in stopping his attempts to destroy all life in the universe. She joined in the Annihilation War, falling into a relationship with Nova, who later saves her from a Phalanx assimilation (think “Star Trek’s“ Borg). Afterward, she joined up with the “Guardians of the Galaxy,” still suffering from Phalanx hive-mind withdrawals. “I am Groot.” The only words this alien tree-like creature ever speaks, and yet Rocket Raccoon understands him perfectly. Originally created as a monster seeking to capture humans for experimentation, Groot was re-imagined as a more heroic figure. Also, he is actually speaking a full language; it only sounds like the same phrase repeating. On a planet of tree-like beings, Groot was ostracized for caring about mammals. Found arrested by the Kree alien race for mysterious reasons, Groot was freed and joined Star-Lord in the battle against Annihilus. It was there that he began his deep friendship with Rocket. He nearly died, but survived as a sapling which had to be nurtured to maturity in a pot. 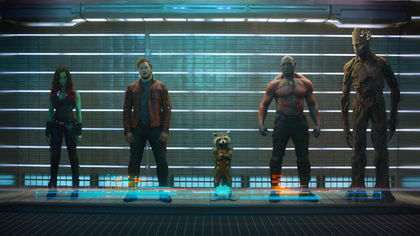 During this time he joined the “Guardians of the Galaxy,” alongside Rocket. Appointed “Supreme Accuser of the Kree Empire,” Ronan was the first of his race to venture to Earth. After defeat at the hands of the Fantastic Four, the Kree became constant thorns in the side of the Earth-based superhero population. He defended the Kree Empire during the Annihilation War, and wound up as its ruler. A space pirate and mercenary who seized control of Thanos’ ship, claiming that he was her grandfather. Insulted by her claims, Thanos nearly killed her, regaining control of her ship and leaving her a burned and disfigured undead figure. She was able to recover her life, but was later converted into a cyborg. In the Annihilation War, she battled as one of Gamora’s followers, taking on Ronan the Accuser. An agent of the Kree Empire, Korath is a cyber-geneticist. He gained superhuman powers using cyber-genetic technology he designed. He has attacked the Avengers and faced off against Captain America individually. He became assimilated into the Phalanx shortly after reuniting with Ronan the Accuser. A founding member of the original future-based “Guardians of the Galaxy,” which was created to battle the Badoon, Yondu was a primitive being on the first planet colonized by humans with inherent empathic powers. He has a special bow that shoots sound-sensitive arrows that can change direction in response to certain whistles. One of the Elders of the Universe, the Collector is billions of years old. He has spent countless years maintaining his hobby, collecting interesting artifacts and life forms from around the universe. Using the power of prophecy, he was able to foresee the threat that Thanos would be for the Elders. He has had several run-ins with other Marvel heroes, as he once sought to collect the Avengers. A space militia from the planet Xandar, Nova Corps is powered by the Nova Force generated by a living computer, the Worldmind. They are defenders of Xandar primarily, but they often aid in other galactic wars and battles, serving as a peacekeeping force. The Nova Corps has been destroyed multiple times, but always manages to recover and return. “Marvel’s Guardians of the Galaxy” is a brand new, space-faring adventure blasting off in theaters on August 1, 2014 and expanding the boundaries of the Marvel Studios cinematic universe further than ever before. The film follows a diverse team of five aliens, led by Peter Quill of Earth (a.k.a. 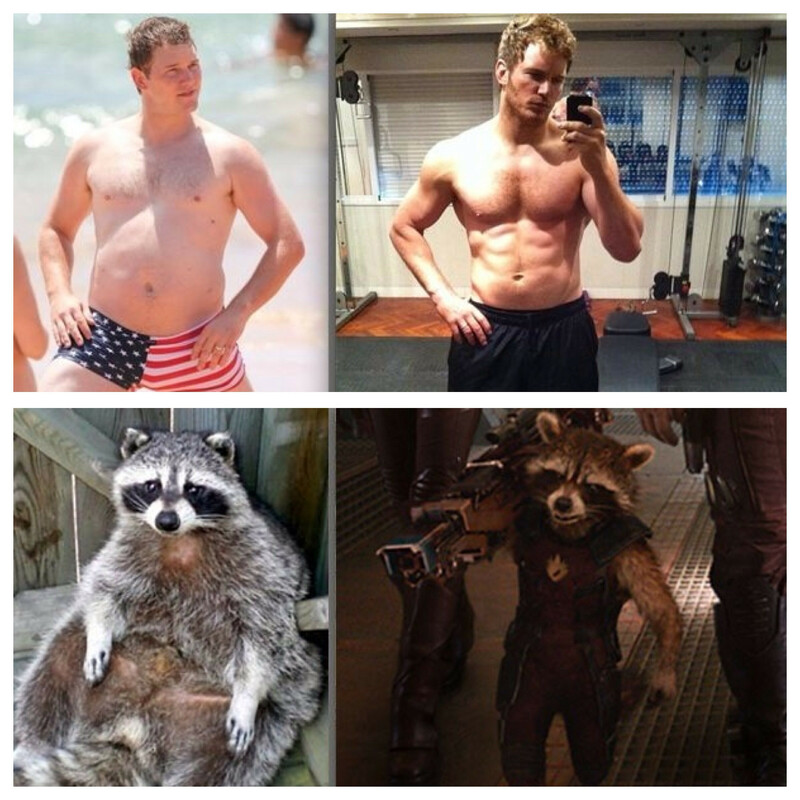 Star-Lord) and featuring Gamora, Drax The Destroyer, Groot and the wisecracking, genetically modified Rocket. Together, these self-described Guardians of the Galaxy will team up to defeat cosmic evil that threatens the entire universe. Hasbro celebrates the world of Guardians of the Galaxy with a new toy line featuring figures from the Legends Infinite Series line. Kids and fans can collect their favorite characters from “Marvel’s Guardians of the Galaxy” in this assortment. These impressive six-inch scale figures feature detailed articulation and detailed sculpting and deco. 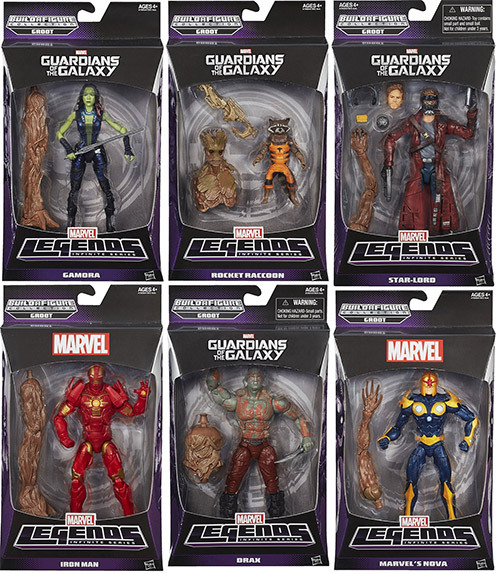 Figures include Star-Lord, Rocket, Gamora, Drax and even Iron Man and Nova! Also, if you collect all six figures you can create your own Groot Build-A-Figure!